The principal colours, black and gold, appear in the arms of the Holy Roman Empire, its medieval fiefdom of Namur, and the village of Andenne, these places being respectively the earliest location of the name Ravignat, the source of the name in Belgium, and the modern village of Mr. Ravignat’s Belgian family. The red lion refers to the etymology of the name, old Germanic for “son of a powerful warrior”. It symbolizes courage and readiness to defend, and is also the main charge on the coat of arms of Belgium, Namur and Andenne. Red is also the main colour on the arms of the Seigneur de Bierwart, Bierwart being the place where the name Ravignat was first recorded. For the Canadian branch of the family, the lion is linked to the ancestor Ernest Ravignat, who, as a stone mason in the early 1900s, carved heraldic lions at several Canadian public buildings. The maple leaves and fleurs-de-lis of the coronet symbolize Canada and French as the mother tongue of the Ravignat family. A fleur-de-lis was also the main charge used on the arms of the Seigneur de Bierwart. The eagle alludes to Mr. Ravignat’s father, Raymond Ernest Ravignat, who served in the Royal Canadian Air Force during the Second World War and is in the style of the eagle of the Holy Roman Empire. This Latin phrase means “Courage in love and battle”. 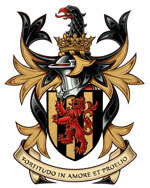 The label of three points indicates that is the heir of the undifferenced arms of his father Gilles Éric Ravignat. The label of five points indicates that he will be the second inheritor of the undifferenced arms of his grandfather Gilles Éric Ravignat. The heart symbolizes that she is the first daughter of her father Damien Raymond Ravignat, and for her also alludes to the traditional Claddagh ring of her Irish Brady heritage through her mother, Jennifer Hendricks. The crescent distinguishes his arms as the second branch of the family. The label of three points indicates that she will inherit the arms of her father Mathieu Gérard Ravignat. The crescent of her father also symbolizes for her the Middle-Eastern heritage of her mother, Fidaa Abou-Nassif. The crescent of her father also symbolizes for her the Middle-Eastern heritage of her mother, Fidaa Abou-Nassif. The lily branch symbolizes purity, and is a reference to her first name: Gabriella is the feminine form of Gabriel, and the Archangel Gabriel is sometime depicted holding a lily. 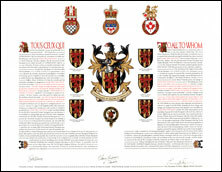 The announcement of the Letters Patent was made on November 12, 2011, in Volume 145, page 3515 of the Canada Gazette. Original concept of Darrel Kennedy, Assiniboine Herald, assisted by the heralds of the Canadian Heraldic Authority.